As I was planning a trip up to the family cabin at Mahood Lake I knew I had to make my Mennonite Oma’s Russian bread. 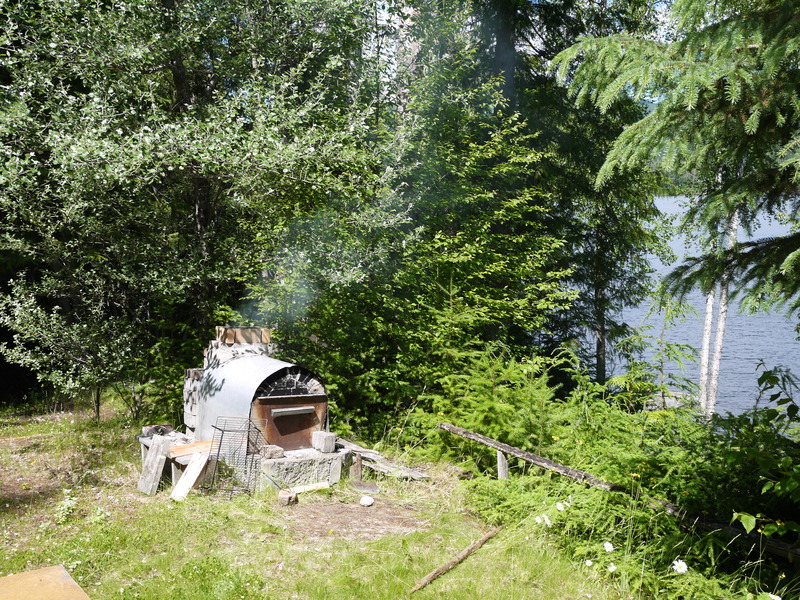 I love taking the opportunity to bake in that oven when I go up to the lake, because it’s the only place where I have access to one. and it is so much fun. I usually just make pizza in there, but this time I wanted to branch out a little, so I thought of my Oma’s awesome dark-crusted bread. My Oma was born in the Ukraine where they made this type of bread, and then she lived in Paraguay for 15 years where she also baked it in an outdoor oven. In the early 1980’s my Opa built this great brick oven, in the style of the Paraguayan Mennonite ovens. 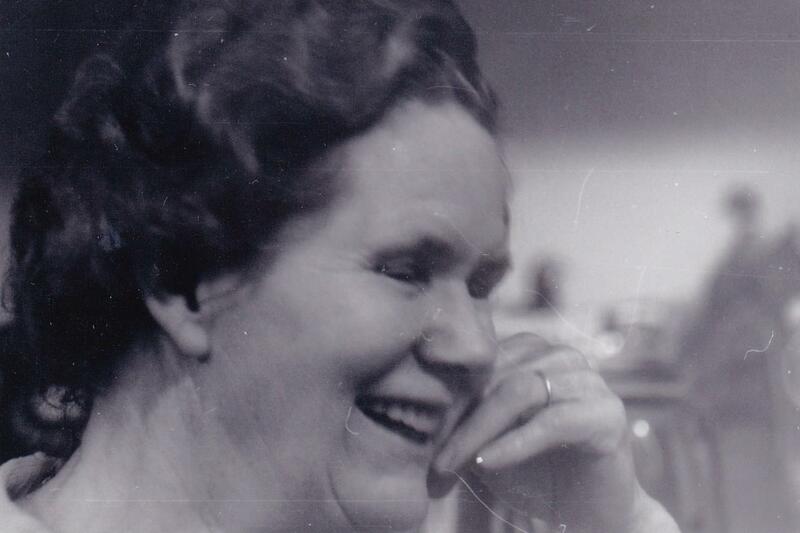 My Oma always made this great bread – it was dark brown, almost black on the outside, with a thick crust, and tender inside. Now, I’ve got the recipe, and I made a delicious loaf of bread, although I fully admit that it is nothing like my Oma’s bread. I asked her in the past how she got that great crust on it, and she told me she just put all the ingredients together – so she had a magic touch that I can’t figure out. Oma passed away a few weeks ago, so her secret it gone too. 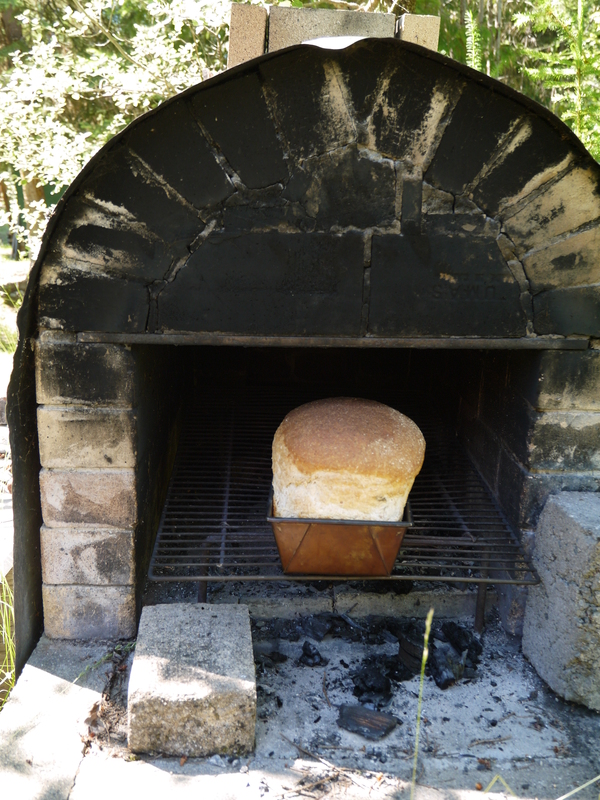 You don’t need the brick oven to make this bread, it’ll work fine in a conventional oven. I used a machine with a dough hook, but you could do it by hand if you’re feeling energetic. This recipe makes 3-4 loaves. If you’re using a brick oven you need to get a really good fire going so it’s smoking hot in there. I pushed some of the coals to the back of the oven so it would retain heat for a full hour. 1. Boil the potato in about 3 cups of water until it is soft. Place the potato, saving the liquid, in a 2 cup measuring cup. Smash the potato up with the back of a fork, then add enough of the potato water to fill the measuring cup to 2 cups. Allow this to come to room temperature. 2. In a large mixer bowl add about 2 tablespoons of warm water and sprinkle the yeast top. Wait until the yeast begins to bubble and is all dissolved (if it doesn’t your yeast may be dead). 3. Add the potato water and buttermilk to the yeast mixture. With the machine running and using a dough hook, gradually add the flours, bran and salt. Mix until you have a moist dough, using more or less flour to get this consistency. Keep mixing until the dough begins to form a bit of a ball. 4. Remove the bowl from the mixer and cover it with a clean damp tea towel. Let it rise to about double in volume; this will take about 1- 2 hours, depending on how warm your kitchen is. 5. Punch the dough down, then turn it out onto a floured surface. Give it a few kneads, then cut into 3-4 equal pieces. Form a loaf with the seam in the bottom and place in loaf pans. Cover with the damp tea towel and let it rise, again to about double, which should take slightly less time than the first. 6. Heat the oven to 400F. When the loaves have doubled in size, and they hold an indentation when you poke the dough lightly, they are ready to go in the oven. If you want to get more of a crust on your bread, you can spray the inside of the oven with water just before the bread goes in. Just try not to spray the light bulb, as it might shatter. Place the bread in the oven and bake for about 1 hour. 7. You will know the loaves are ready when you tap on the bottom of the pan and it sounds hollow, so keep an eye on it in the last 10 minutes or so of baking to see if it’s looking done, and test it using this method. 8. Remove the bread from the pans and let it cool on wire racks. 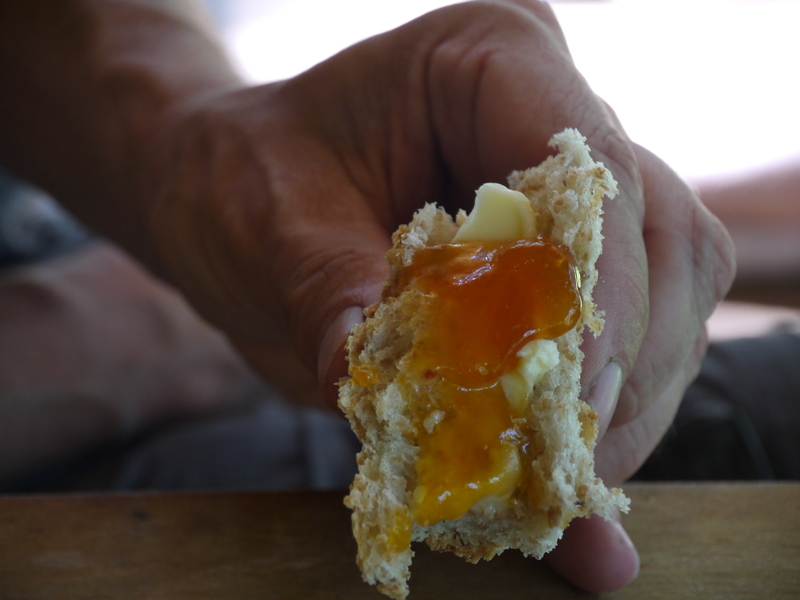 Once it is mostly cool you can slice it up and then slather on some butter, but we just broke of satisfying chunks and ate some with butter, and on some we added apricot jam. Not quite like Oma made it, but delicious nonetheless.